Dublin Airport welcomed more than 3.2 million passengers last month, making it the busiest August in the airport's 78-year history. 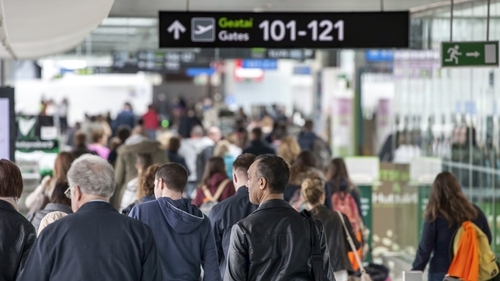 There were similar passenger numbers in July, and during both those summer months, the whole population of Ireland, effectively, passed through the airport. Passenger numbers increased by 6%, boosted by the introduction of 14 new routes over the summer and extra capacity on more than 50 existing services. Paul O'Kane, chief communications officer with the DAA, said Dublin Airport is enjoying the fruits of success but that success brings its own challenges. "We are enjoying record passenger numbers and that has a hugely positive impact across the economy," he said. "The passenger numbers we welcome into Dublin actually translate into visitor spending and visitor traffic right across the country. The airport is about to start consultations with its airline customers on a €900m investment. Earlier this week, Aer Lingus and accountants EY published a report that said developing the airport as a transatlantic hub could generate €18.6 billion for the economy. "Their plans and our plans are completely aligned," Mr O'Kane said. "It is national aviation policy to develop Dublin Airport as a hub, and we are already doing that. This year we will have around 2 million transfer passengers at Dublin Airport, and that's a business that didn't exist in 2011. That's 2 million passengers who don't begin or end their journey at Dublin, so they are using it as a hub and then flying across on transatlantic flights. This summer we had 10 airlines operating 446 flights to and from 20 destinations in North America. We are investing heavily to expand that business." Mr O'Kane said the airport is working on the procurement process for a new runway and they will be announcing the placing of that contract in the very near future. "We should have the contractor on site in the fourth quarter of this year," he said. Developing the airport as a hub will require further infrastructural changes. "Parking stands are particularly important because obviously a lot of the transatlantic traffic for a hub is on a wide body plane. But one of the advantages that Dublin has is the new generation of aircraft are now able to take transatlantic flights on a narrow-bodied aircraft which have a much longer range, so we'll be adding parking stands for narrow bodied or wide bodied aircraft," Mr O'Kane said. The airport will also see the construction of more aircraft boarding piers and modifications to the existing terminals. Another advantage of Dublin Airport is its location and it is ideally situated as a hub. "For a lot of people in Europe, it makes complete sense to fly through Dublin as you're flying in the right direction. We have USCBP (US pre-clearance) which no other capital city in Europe has, and if people are travelling to the United States, they can avail of pre-clearance in Dublin. When they arrive in the US, the first queue they'll encounter is the taxi queue," Mr O'Kane said. MORNING BRIEFS - The Bank of England's Governor has warned the UK government that a chaotic no-deal Brexit could crash house prices and send another financial shock through the economy. Mark Carney's worst-case scenario was that house prices in the UK could fall by as much as 35% over three years. *** Cignal, a company that provides telecommunications infrastructure, has announced it has refinanced and expanded its financing facility. Cignal's acquisition of Coillte's tower portfolio in 2015 was supported by an initial €31.5m facility. This is now being refinanced and expanded to €65m. The funding will be invested in new telecoms and broadband communications towers to address coverage blackspots throughout Ireland. *** Volkswagen is ending production of its Beetle next year as sales in the famous car have fallen in recent years. The German company said output would end at its plant in Mexico next July after production of celebration models. *** Chief Justice of Ireland Frank Clarke has said a no deal Brexit would give rise to great difficulties in legal issues involving the UK and other EU member states, or outside third parties such as US corporations. Mr Justice Clarke said that Ireland could become a safe haven for many international disputes, as the only full common law country in the EU. *** The head of Amazon is to commit $2 billion to help homeless families and start pre-schools for low-income communities. Jeff Bezos is the world's richest person with personal wealth of over $160 billion.